Last week my 1997 Jetta VR6 turned on her check engine light. Doh. So I embarked on that adventure that every car owner does in a new city – find a good auto mechanic. Since I have a Volkswagen, I’m limited to shops that deal with European cars, making it tougher to find a good yet affordable mechanic. Luckily yelp, my favorite review system, has auto repair reviews. I took the best ones where people mentioned VW, Volkswagen, or Volkswagon (many misspell it), and cross referenced them with what I found on cartalk mechanic reviews. I came up with 3 I wanted to try. The first shop I called, Accurate Imports, was able to inspect my car that day, spending about 2 hours and coming up with an exhaustive list totaling about $2k in repairs. Ouch. However, they only charged my $10 for pulling a nail out of the tire and patching it – diagnostics and estimate were free. At this point I decided I should get one or two more estimates before dropping that kind of cash. The second place I visited, European American Motors, did a brief inspection, charging me $56 for check engine light diagnostic and listing similar items (although not as complete as the first, but they acknowledged they need to hoist up for a thorough check and did not have time that day). The third shop, Chicago Import Service, did not have time to see me till the following Tuesday. I was there for almost 2 hours and they didn’t find much wrong at all, charging me $95 for one hour’s worth of labor. All three shops reported the engine light turned on because of a lean fuel condition, with AI and CIS saying they weren’t sure exactly what caused it but thought replacing the fuel filter might solve it. EAM indicated the Mass Air Flow Sensor needed to be replaced. Here is a breakdown of cost estimates, with the forth column being my San Francisco shop, Advanced Audi – VW. First, I want to point out all 3 shops are good – they all gave written estimates and communicated clearly, answering questions intelligently when I probed a bit deeper. Joe and Oscar at AI were the best at explaining, Rudy at EAM gave the most detailed written estimate, and Alex at CIS was above average compared to mechanics in general. Which is better? Not an easy question to answer. However, both AI and EAM found problems with the Serpentine Belt and emphasized that it should be the first thing to be fixed. CIS did not mention this, plus charged the most for labor including an initial hour fee, so I would not recommend them. I liked EAM because Rudy seemed the most knowledgeable mechanic, plus they were a bit cheaper. At the same time, I don’t entirely trust Rudy when he told me I needed to spend $260 to replace my MAF sensor, which i did about a year earlier (There are lots of reports of MAF sensors being replaced unnecessarily). I went with AI because they were the most thorough, which is most important. They are not the cheapest, but they listed items my SF mechanic mentioned when I had my VW checked in July, 2008. Plus they were great communicators, seemed experienced, were knowledgeable, and appeared quite trustworthy. 12/12 Update – AI did the job as expected, about $2,000 (half in labor, half for parts). I mentioned the Mass Air Flow Sensor, and their response was that the engine light code was for lean-fuel, MAF has a different code. They also pointed out that the MAF has little wires that are sensitive and can get dirty, causing it to appear broken but often it just needs a little cleaning. 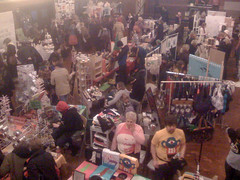 Today Shayna and I went to a holiday craft fair, one of many done by the Renegade Craft Fair kids. There were about 150 vendors, each with their own table and craft, selling t-shirts, jewelry, posters, and other interesting pieces of art. There was tons of cool stuff (check the vendors section of the website for a complete list), but a few are worth mentioning. Shayna got a cool chicago poster from Ork posters. I also liked zombie plates, wearing your heart on your sleeve, haha shirts, posters, and these soft little monsters. Support Independent Artists!!! We moved into our new apartment on September 1, and now, 3 weeks later, I am finally starting to feel settled. Hurray. But before I get into that, let me describe our awesome new place as well as mention a few happenings over the last month. Our apartment is HUGE. Almost twice as big as 116 in San Francisco. And its cheaper, better condition (hardwood floors, beautiful wood trim, etc), laundry in the building, one neighbor upstairs (not an old lady .. bring the noise!). Neighborhood is great, too – plenty of street parking, covered with trees, 3 minute walk to the Blue Line (subway stop), 5 miles from the Loop (downtown Chicago), and several bars and restaurants within a 5-10 minute walk. I also splurged and got fast internet and satellite HD TV (read my AT&T blog for more). Everyone says Chicago is awesome except for the winter – so being close to the subway and to corner stores, bars, and restaurants is essential. Good work Shayna on picking out such a badass pad. Besides spending time getting settled, we have also been busy doing… things. Most notable were the friday night out with Anu, Corey, Mazen and crew, Bobby’s visit where we had drinks and dinner, and the block party last weekend with Monotonix. 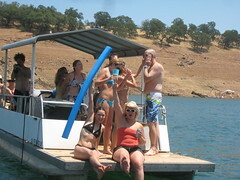 We’ve been hanging mostly with Shayna’s college friends – Rachel, Brandon, Lara, Katie, Jenn, etc. As mentioned in earlier blog, Rachel and Brandon were dope enough to let Shayna kick it on their couch for a couple weeks while she was apartment searching. And pretty soon we’ll be starting up a bike gang .. so hide your booze and daughters. Other fun times include bowling and beers with Lynn Trahey, and getting our dance on – once on a monday night at subterranean with shana (yes, 2 of ’em in logan square), another time to see DJ Mehdi at Debonair Social Club, and Friday we’re planning on seeing Flosstradamus at Sonotheque. All three are like 20 minute bike ride from home. Werd. So yeah, getting settled. We had to buy lots of furniture, meaning I spent lots of time shopping at thrift stores, which chicago has tons of. The best is Brown Elephant, but Ark is good as well, and Target and Ikea are cheaper than most other used furniture stores. Did i mention we have 2 giant Targets about a mile from us? 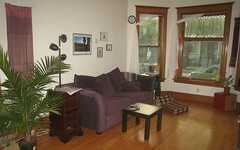 Used items bought in chicagoland include our purple couch, kitchen table and a chair. New items include TV stand (a buffet table), 2 dressers, bookcase, many shelves, and several plants. We still need a bed frame, a dining room table, and a couple more little comfy stool seats, but those are low priority. Next I need to explore more of the city, start thinking more about jobs, and continue studying for GMATs .. oh yeah, I’m taking the GMAT this fall, possibly hit up grad school next year and get me selves one of dem MBA’s. I recently moved to Chicago from San Francisco and, of course, had to figure out how I was going to get me some internets from my new pad. In SF we found free wifi from the neighbors, but in Chicago we had no such luck – all the neighbor wifi signals were secure (encrypted). That was fine by me, I was ready to have my own fat pipe at home – both shayna and I would get annoyed in SF when our free wifi wasn’t working or forcing us to sit by the windows. I was also interested in getting HD cable or HD satellite TV. I haven’t had anything besides over-the-air since 2003, but i bought a nice HDTV from a friend that needed some HD content. Plus Shayna wanted to get a landline so she could do some work over the phone without eating too many minutes on her cell. So off i went to find internet, cable/satellite, and phone. I first looked at comcast, the most popular around here, and they offer all 3 – internet, HD cable, and phone. But I wanted quality HDTV, and I know comcast HD is not as good as others (comcast quality march 2008). Also, I was pleased with Dish Network when i had it in 2003. Some sports nuts like Direct TV better, but that ain’t me. So now i just need to find me some internets. Finding a Internet service provider was a bit more challenging. According to dslreports, there were many offerings in my zip. However, many said they did not offer service at my address – including RCN, verizon, etc. Covad was available, but starting at like $100/month. Ouch. Speakeasy was a good choice, one of the most reliable and best customer service, for about $55/month for 1.5/384 or $95/month for 3.0/768. Ok, also high but more doable, but i figured i should also consider comcast. Comcast had many options, but here’s a quick summary of the triple play i considered. All these have the same cable options, about 200 or so cable channels, including 40 or so HD channels, a HD DVR (like tivo), which was $4/month more than normal DVR, and internet. Total was $132 for 6.0/384 internet plus cable and HD DVR, or $140 for 8.0/384 internet, or $159/month for 16/768 Internet. I also read many horor stories about comcast changing the price on their customers .. one guy got a $30 increase on his monthly bill. Comcast? I don’t think so. In the end I went with AT&T. At first their website said they did not offer service at my address, but some blogger said that you should call to double-check. I did, and they did have ‘manual’ service at my apt. The nice lady at ATT had many deals, including combos not on their website, so i’ll just list what i ended up getting – cheaper than comcast and they even partner with DISH for my area (U-Verse, their new TV over internet option, was not available for my location). Notes: $5/month off DISH cuz AT&T deal, $10/month off internet cuz i got a phone line. Initial costs were .. -$110. Yep, I walk away with $110. Breaks down like this: $40 for phone (would be free if i got $30/month free long-distance phone), plus $50 for internet modem. Dish equipment and installation are free. Thats $90 in costs, but i also get $200 cash back – $100 for internet/phone, and $100 for DISH. So $90 costs – $200 cashback = -110. My contract is for 24 months, but only DISH charges anything if i cancel early – $10/month. So if i cancel at 14 months, 10 months before contract, i pay $100 to Dish. If i want to move at 12 months, DISH will install my same setup at new spot for free (DISH offers one free installation per 12 months). Pretty sweeeeet !!! I got .. misled on initial costs. I only got $100 cash back, not $200 ($50, not $100 for each check), and costs were $70 for internet ($50 modem, $13 shipping, $7 tax), $47 for phone ($64 first bill minus $17 monthly), putting my initial costs at about $17 (still not bad, but $127 less than I was told.). But what i’m really pissed at is the billing chaos. More important than the errors and confusion, was the amount of time it takes to sort this out. I spent about 4 hours total on 4 different occassions dealing with AT&T customer service. Their managers seem competent, but do not trust anyone else. The first billing confusion was based on the fact that I was told that I get free outgoing calls within 15 miles. A manager at AT&T Customer Service assures me there is no such thing, and tried to sell me an outgoing call package deal. No Thank You, Ma’am. Secondly, DISH is all sorts of messed up .. took 3 calls to sort of straighten it out. See this picture with details on DISH Bill. Basically they give you lots of credit on first bill to cover first and second bill, and the third bill should look normal. Did you look at that Bill? what’s so hard about saying “TOP 200”, “Local HD”, “HD Silver” ??? One thing nobody mentioned is that they charge you $5/month if you don’t connect your DISH receiver to phone or wifi – “ADDL RECEIVER ACCESS FEE”. What? . $35/month Elite internet (6mbps/768kbps up/down) – as promised, yeah! Related – I found a nice comparison of HD channels available nationwide. Here I am, the day before the SF Marathon and about to move to Chicago. The marathon has always been something I’ve wanted to do, and I’m glad I’m running it, but will be happy to have it behind me. Running has always been about exercise and stretching so my back doesn’t cause me trouble again. After various goodbye parties and dinners, it finally hit home this week that I’m leaving San Francisco – perhaps because we finally started packing. 10 years I’ve lived in in SF, 13 years in California. I’ve grown up alot in California, met a ton of people, and had more fun than most people have in a lifetime. Yes, I’m sad to leave. I’m sad to leave a beautiful city – the parks, the victorian architecture, the awe-inspiring golden gate bridge, the wonderful hikes within a short drive, the myriad of outdoor options for weekend adventures. And the bay area people are smart, creative, helpful, tolerant, fun – almost too fun. And my friends .. too many to name, but they are all like my family. I will miss them but plan on seeing them by coming back SF often. We already got tickets for Halloween in SF. 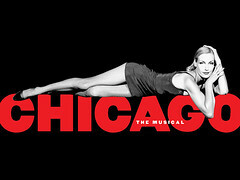 I am looking forward to Chicago. A new chapter in my life. I must admit that I have felt like I haven’t grown much the last few years. Don’t get me wrong, I’ve had alot of fun, met new people, and went traveling around the world – great things which I am grateful for. Give Thanks. However, Chicago will bring a new city, new friends, and a new job .. hopefully something that I can sink my teeth into. And hopefully Shayna and I not just survive, but flourish together. Oh, and for the record, Shayna and I are driving my Jetta to Chicago, leaving Tuesday August 5. Our route includes Salt Lake City, Grand Tetons, Yellowstone, Fargo, Minneapolis, then Chicago – I’m really looking forward to some chill time camping in Yellowstone. On August 15 I fly back to SF while Shayna stays in Chicago and looks for our new apartment. My solo time in SF includes a wedding, packing, seeing beck in GG Park, more packing, and having one last beer with friends (watch out). My last day as a SF resident will be Wednesday, August 27, when I fly out of SFO. The votes are in .. I’m moving to Chicago !! Yeah, I know. Big move. I love the bay area. I’ve been in San Francisco for 10 years – It’ll be just over 10 years when we move in August. That’s right, August – gotta get Shayna to school in time. Why Chicago? Of course for the lovely Miss Shayna Cohen. Shayna is pursuing a MFA in Interdisciplinary Book and Paper Arts at Columbia College of Art, a 3 year program, starting Tuesday, September 2. I’ve been considering going with her ever since she got in a year ago, and I just recently made the decision definite. I’m committing to a year in Chicago, and if it goes well it’ll be more than that. Shayna is definitely the main reason I’m going, but not the only reason. Last year I was gone from California for 6 months traveling. When I came back, I realized that I missed my friends and certain aspects of the bay area, but I was down for trying somewhere else to live. The same itch to travel is pushing me to live in another city. I’ve grown some roots in the social scene here in SF, but career wise I still feel like I don’t know what I want, perhaps chicago might give me some fresh perspective. When I get to Chicago I plan on working full-time again, another big step. Exactly where or what, I’m not sure – I haven’t worked a regular job since April 2006. As of now my general plan has not changed, find something on the tech and business tip. More on that in my april job post. Leaving San Francisco will be hard. I haven’t thought too much about that, I mostly look forward, but will spend some time looking back over the next couple months. I do know that my friends here (including my brasstax crew) have influenced me more than anything else out there, and I will miss them dearly. But we’re still got a long life ahead of us, relationships will come and go, and the strong ones will remain. And a weekend in SF is only a plane ride away. We’ll have a going away party in July most likely – ping me for details.